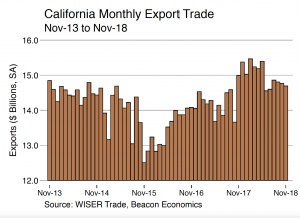 For the first time in more than a year, California’s merchandise export trade fell in November, according to Beacon Economics’ analysis of U.S. trade statistics recently released the U.S. Census Bureau following a lengthy delay caused by the federal government shutdown. Foreign shipments by California businesses totaled $15 billion for the month, a nominal 2.2% decline from the $15.33 billion recorded in November 2017. 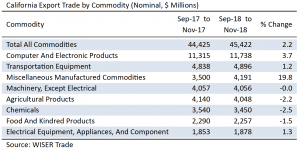 While exports of manufactured goods were off by 3.2% to $9.06 billion from $9.36 billion in November 2017, exports of non-manufactured goods (chiefly agricultural products and raw materials) fell by 4.3% to $2.22 billion from $2.32 billion. The value of re-exported goods meanwhile did rise by 1.9% to $3.72 billion from $3.65 billion. 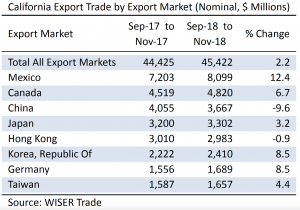 The Golden State accounted for 10.7% of the nation’s overall merchandise export trade in November 2018, down from 11.3% one year earlier. California exports in the first 11 months of 2018 amounted to $164.43 billion, 5% higher than the $156.61 billion at the same point in 2017. The U.S. Census Bureau reports that California was the state-of-destination for 17.6% of all U.S. merchandise imports in November, with a value of $37.57 billion, a decline of 10.9% from the $42.17 billion in imported goods one year earlier. Manufactured imports totaled $33.34 billion, down by 13.2% from the $38.43 billion recorded in November 2017. Non-manufactured imports in November were valued at $4.22 billion, 12.8% higher than the $3.74 billion reported last year in November. For the first 11 months of 2018, California imports reportedly totaled $404.30 billion, a 0.5% gain from $402.42 billion over the same period in 2017. California’s merchandise exports during the September–November period totaled $45.42 billion, a nominal gain of 2.2% over the $44.42 billion in the same period in 2017. Eleven commodity groups posted exports of at least $1 billion during this three-month period. On the plus side, shipments of Computer & Electronic Products (computers and peripherals; communication, audio, and video equipment; navigational controls; and electro-medical instruments) rose by 3.7% to $11.74 billion from $11.32 billion. The state’s exports of Transportation Equipment (automobiles, trucks, trains, boats, airplanes, and their respective parts) edged up by 1.2% to $4.90 billion from $4.84 billion. Shipments of Miscellaneous Manufactured Commodities (a catchall category of merchandise ranging from medical equipment to sporting goods) jumped by 19.8% to $4.19 billion from $3.50 billion. Exports of Non-Electrical Machinery (machinery for industrial, agricultural and construction uses as well as ventilation, heating, and air conditioning equipment) remained unchanged at $4.06 billion. Exports of Electrical Equipment and Appliances improved by 1.3% to $1.88 billion from $1.85 billion. Exports of Fabricated Metal Products grew by 16.0% to $1.23 billion from $1.06 billion. Waste & Scrap exports increased by 7.2% to $1.22 billion from $1.14 billion. On the minus side, exports of agricultural commodities fell by 2.2% to $4.05 billion from $4.14 billion, as shipments of fruits, nuts, wines, and dairy products continued to face higher tariffs abroad. Chemical exports (including pesticides and fertilizers; pharmaceutical products; paints and adhesives; soap and cleaning products; and raw plastics, resins, and rubber) were down by 2.5% to $3.45 billion from $3.54 billion. Shipments abroad of Food & Kindred goods were off by 1.5% falling to $2.26 billion from $2.29 billion. Exports of Petroleum and Coal Products dropped by 10.2% to $1.12 billion from $1.24 billion, as oil prices declined. Mexico handily maintained its status as California’s top export market during the September–November period. Shipments south of the border grew by a robust 12.4% to $8.10 billion from $7.20 billion. Canada claimed second place among the state’s leading export markets, increasing its purchases of California products by 6.7% to $4.82 billion from $4.52. China placed third with $3.67 billion in imports from California, down 9.6% from $4.06 billion. Japan came in fourth with imports of California goods totaling $3.30 billion, a gain of 3.2% over the $3.20 billion it imported during the same quarter a year earlier. Exports to fifth-place Hong Kong slipped by 0.9% to $2.98 billion from $3.01 billion. Golden State exports to the economies of East Asia inched up by 0.2% to $16.04 billion from $16.01 billion. Meanwhile, California’s exports to the European Union edged up by 1.1% to $8.08 billion from $7.99 billion. California’s stake in the U.S.-Mexico-Canada Agreement or NAFTA 2.0 (the revised North American Free Trade Agreement), is manifest in the fact that Mexico and Canada together accounted for 29.1% of California’s entire merchandise export trade in the September–November period, up from a 25.3% share one year earlier. 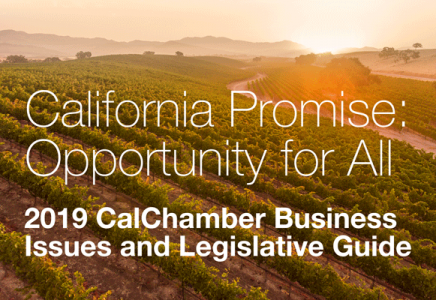 The outlook for California’s export trade over the next several months most immediately hinges on the outcome of two sets of negotiations: those currently underway between U.S. and Chinese officials and those between the White House and Congress over ratification of the U.S.-Mexico- Canada Agreement. In both cases, outcomes are far from certain. Beacon experts hear mixed messages about progress in the China trade talks, which to an uncomfortable extent involve issues that touch on some very basic ideological differences. As was made clear in the just-released 183-page report from the U.S. Trade Representative on China’s lack of compliance with World Trade Organization rules, U.S. negotiators are seeking, not just a reduction in the U.S. trade deficit with China, but also fundamental revisions in the way Beijing runs its economy. Chinese leaders, who seem bent on promoting their authoritarian capitalist model as superior to Western prescriptions for economic growth, are unlikely to accede to such far-reaching demands. At their meeting in Buenos Aires just after last Thanksgiving, President Donald J. Trump and Chinese President Xi Jinping agreed to a 90-day cease-fire in the tariff wars. The White House has warned that, unless trade talks meet with President Trump’s expectations, he will follow through on his threat to raise duties from 10% to 25% on already-targeted Chinese imports on or about March 2. The President also has indicated that he would broaden the scope of Chinese goods that are subject to higher U.S. import levies. The Beacon experts also say it’s impossible to say what President Trump will do since it is not evident what his benchmark for success in negotiating with China really is. Even his own aides reportedly are worried that his single-minded focus on deficits as a measure of the benefits of doing business with trading partners may lead him to accept a Chinese commitment to substantially increase purchases of U.S. goods and services. That commitment, however, would not address a host of more serious issues, such as intellectual property protection, economic espionage, and the role of state-owned enterprises. President Trump may find that promises to buy more from America are a sufficient reason to declare a win. At least equally troubling is the uncertainty surrounding the future of the new NAFTA. For all the media attention devoted to the U.S.-China trade battle, it’s worth keeping in mind that Canada and Mexico are both larger export markets for California goods.